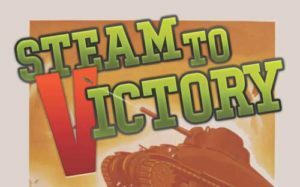 Detailing all of the work that occurred at the Age of Steam Roundhouse during 2014 would comprise a lengthy report, so we will give you some of the highlights of the year’s activities. As usual, much was done in all departments and more so in others. We attended a local liquidation auction of a large manufacturing company, and returned home with much assorted tooling, old shop carts, parts and machinery loaded into a 40-foot trailer. For us, this auction filled out many of those small, everyday supplies that shop workers need and love to have on hand. 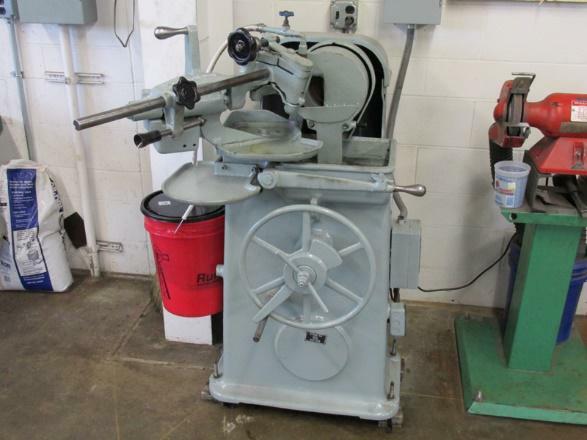 The AoSRH back shop purchased numerous replacement machine tools, including several drill presses of different sizes, more work benches and additional storage cabinets. 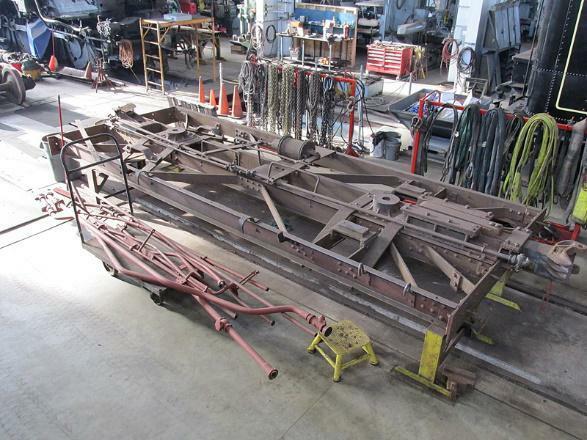 Our Niles quartering machine is in the final phases of wiring, and will have an operational test during January 2015. This machine was constructed in the United States and shipped to Poland after World War II to help rebuild that country. With the demise of steam locomotives in Poland, this machine was sold and shipped to England where we purchased it two years ago. It has been completely reconditioned by Age of Steam Roundhouse forces, including installation of many new shafts, gears and miscellaneous parts as well as the replacement of all associated seals and gaskets. 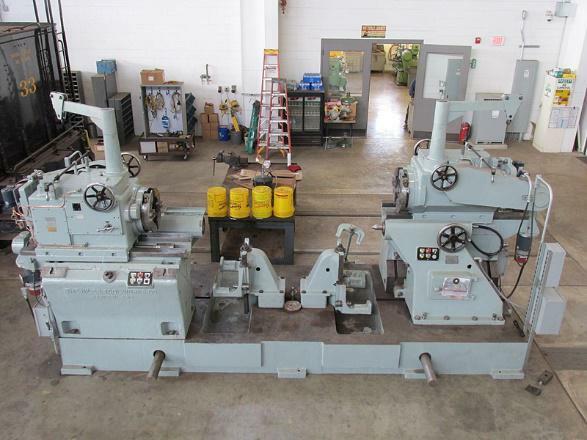 Leveling this machine tool and bolting it to the floor of the shop is now in progress. We eagerly look forward using it in service again. 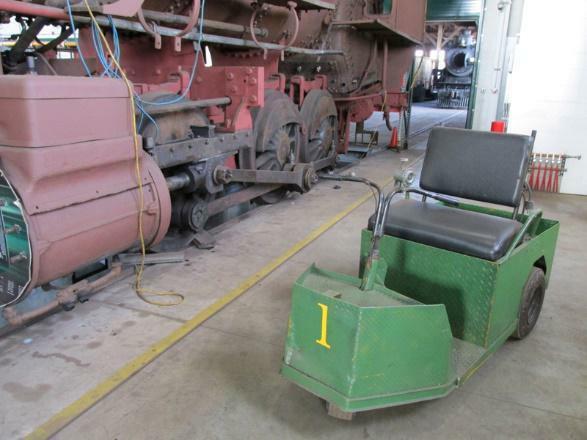 While not the most historic form of transportation at the Age of Steam Roundhouse, the facility’s “go-getter”—a Cushman constructed, foreman’s electric cart—was placed back into service. It was amazing to see just how quickly this convenient conveyance became a heavily used and speedy method of transporting tools and small parts—and up to two people—between the storehouse, roundhouse and back shop buildings. And it really saves a lot of time while scooting around outdoors to distant locations on the AoSRH property. Nope—this is not a model railroad, but it surely looks like one! The addition of this small tool house between the existing wood water tank (out of picture to the right) and the ash pit hoist was accomplished during late autumn. 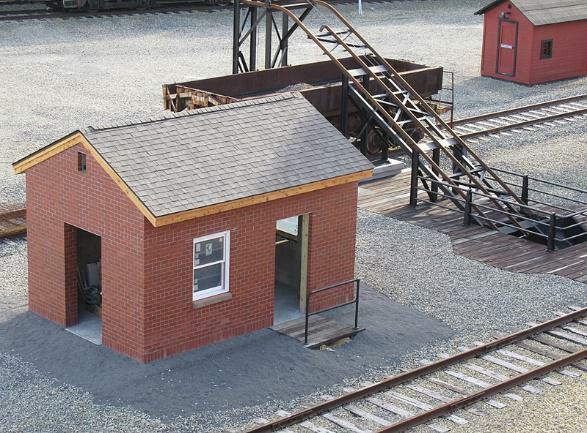 When completed, this simple structure will contain a work area as well as storage of supplies needed for servicing locomotives on the adjacent ready track. The final details of installing doors and windows are now in progress. The New Age of Steam Depot and Office Building. Designed with the appearance of an old railroad depot, Age of Steam Roundhouse’s general office building is under construction and on schedule this winter. The bulk of the exterior work was completed before the weather turned cold, and craftsmen are busy installing plumbing, electrical, heating/cooling, walls and ceilings, etc., to the structure’s interior. Just as with our shop and roundhouse, radiant heat floors were installed inside the new depot, thus making the working climate very comfortable for today’s construction crews and future office employees. Installation of old lamp posts, historic signage and an operable train order semaphore will assure that our new headquarters will look right at home in the 1930s-era. For pedestrian safety, decorative “hairpin” right-of-way fencing between the platform track and roadway will be installed. When completed this spring, the new building will contain the main offices and conference room for the Age of Steam Roundhouse facility, thus allowing all employees to work at one, central location. 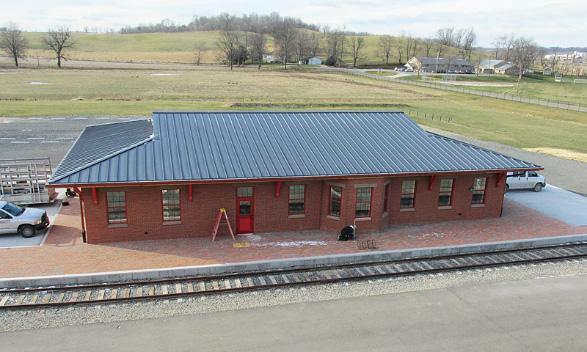 The building will also house a ticket office, waiting room, gift shop and ADA-compliant restrooms for the convenience of groups taking scheduled, guided tours through the Age of Steam Roundhouse starting this coming summer. Details regarding these upcoming scheduled tours and advance-sale ticketing will be announced on our website as soon as they become available. Please DO NOT contact us for group tour information at this time. 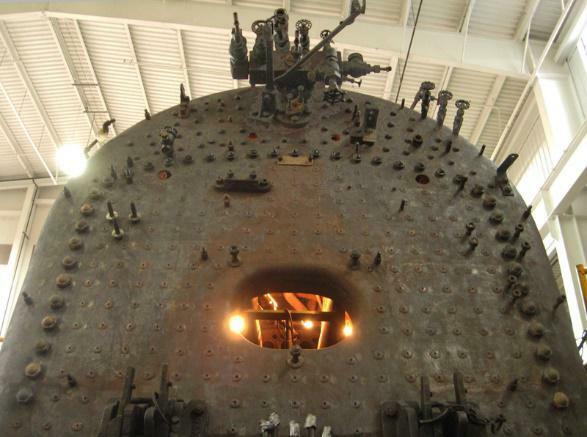 Firebox work to our huge, ex-Lake Superior & Ishpeming 2-8-0 #33 continues this winter, including the manufacture and installation of a new crown sheet, door sheet, partial side sheets and thermic syphons. After getting into the otherwise expected crown sheet repair work, we saw the condition of these other steel plates and realized that they would need replacing within a few years. 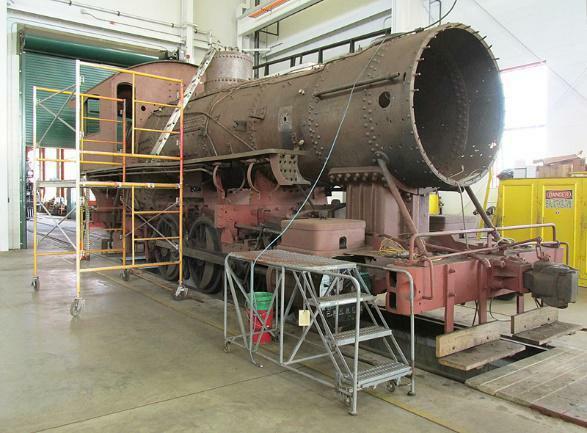 Because it would be less expensive to do such extra work now while #33 is disassembled, it was decided to replace additional square feet of firebox at this time. This means that less work will be needed when #33’s FRA-mandated, 15-year time limit comes due. All other repairs on the locomotive’s “to-do” list have been completed, and when this boiler work has been accomplished #33 will be ready for service once more. Morehead & North Fork 0-6-0 #12. Locomotive #12, ex-Morehead & North Fork 0-6-0, has had all of its 2-inch boiler tubing removed in preparation for a thorough descaling and ultra-sound testing of the boiler shell, firebox and other pressure components. Boiler stud replacement and repairs to staybolts and staybolt sleeves are underway. 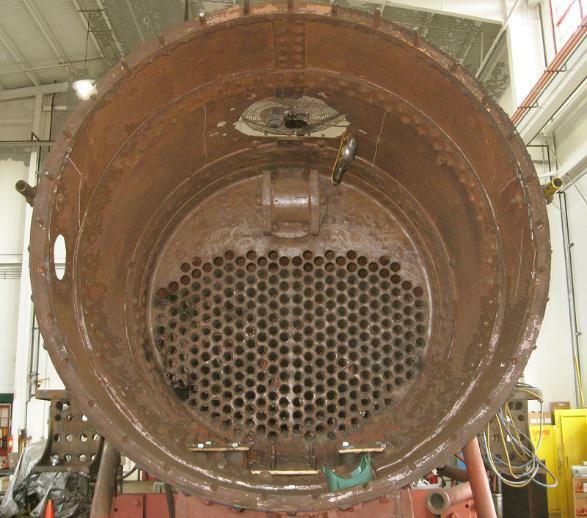 The boiler recalculation information is being gathered to meet the Federal Railroad Administration requirements for the 15-year/1472-service day requirements under the FRA’s new rules for steamers. Just received from a local foundry are a new smoke stack, stack base ring and exhaust nozzle. We still need to machine the fit of these new portions, drill the mounting holes and attach them to #12’s now-empty smokebox. This 1905 product of Alco’s Pittsburg (no “h”) Works has been a fun, yet challenging, project on which to work. Morehead & North Fork 0-6-0 #12 Tender Frame. The decrepit tender of ex-M&NF #12 has been dismantled and its frame and trucks are being reconditioned. 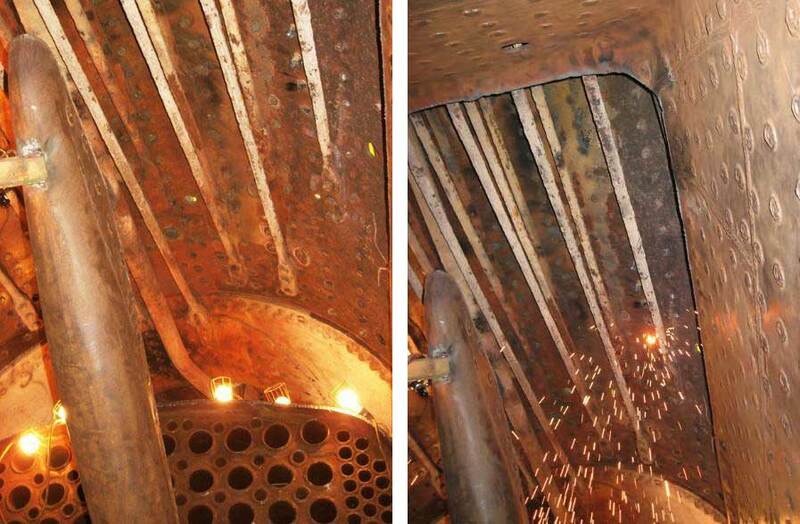 The big job of renewing the tender’s rusted-out cistern and coal bunker has been put out for bids from several steel fabricators, and we are anxiously waiting to see what the lowest bid will be. During restorations here at AoSRH, we always attempt to reuse as many original parts when it’s safe and suitable to do so, thus saving us time and money—and adding more authenticity—by using the salvageable, associated hardware from the old body. CP 4-6-2 #1293 on the road. 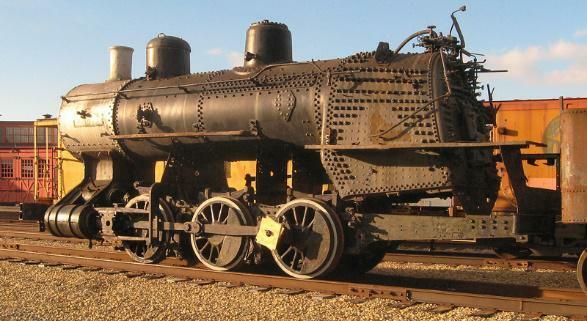 Our workhorse locomotive, former Canadian Pacific 4-6-2 #1293, was able to kick up its heels a few times during 2014. The most significant fire-up was a fund-raiser staged for the benefit of a main line steam operation in Poland called the Wolstyn Experience. Our guests were mainly European rail buffs from England, Germany and Poland who had toured several American steam operations in the East, and arrived in Sugarcreek on the last leg of their 10-day American visit. These 60 rail buffs were given an informative guided tour of the Age of Steam Roundhouse and shops, and sitting at tables that had been set up between the steam locomotives in the roundhouse, enjoyed a superb Amish-style meal catered by Beachy’s Restaurant. The highlight of this perfect autumn day was a vintage photo-freight powered by #1293 between Sugarcreek and Baltic on the Ohio Central Railroad (Genesee & Wyoming) main line. Our guests chased the special steam CP 4-6-2 #1293 on the road CP 4-6-2 #1293 on the road train by bus on a parallel highway, and photo run-bys were made at several locations to the enjoyment of all involved, including AoSRH employees! 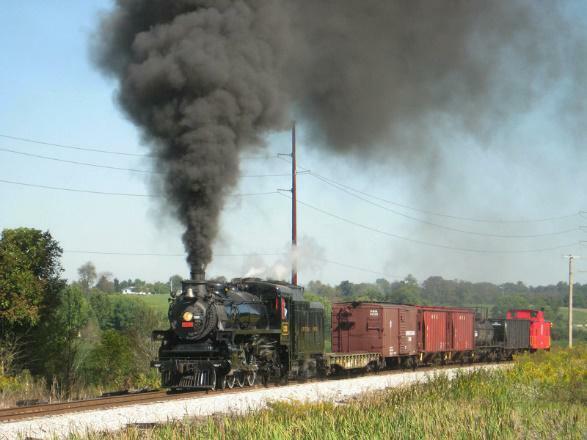 This was familiar territory for #1293, as it had hauled many passenger excursion trains during the 12 years that Ohio Central operated steam trains out of Sugarcreek, Ohio. 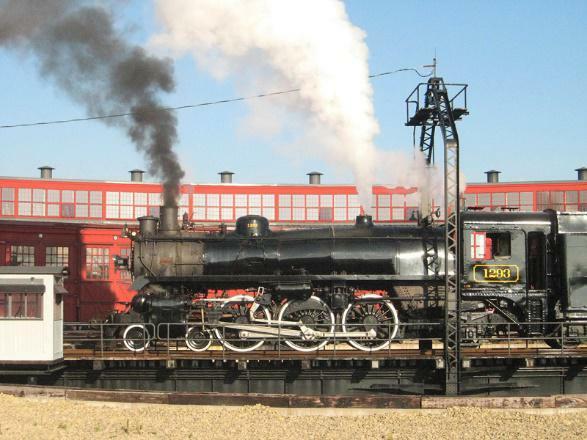 During November 2014 the AoSRH stabled another steam locomotive acquisition, this one in the form of ex-Buffalo, Rochester & Pittsburgh 0-6-0 #152. It was constructed by Alco Brooks during January 1904 (boiler serial number 28753), and survives today as the only existing BR&P locomotive. This 0-6-0 is equipped with 20”x26” inside admission cylinders and Stephenson valve gear, has a grate area of 28.3 square feet, carries 180 pounds of boiler pressure, weighs 144,100 pounds on its half-dozen 51-inch driving wheels, and develops 31,200 pounds of tractive effort (at 85% of boiler pressure). 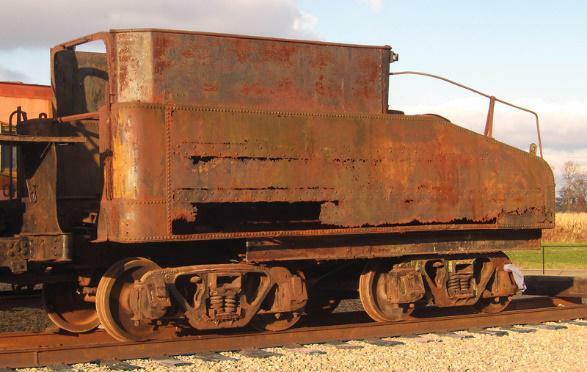 Its diminutive slope-back tender carries just 4,600 gallons of water and 6 tons of coal. Baltimore & Ohio took control of the BR&P in 1932, and this engine became B&O #1190. When retired from the B&O this 0-6-0 continued working for its new owner, the Ohio River Sand & Gravel Company at Point Pleasant, West Virginia. When its fires were dropped for the final time, #1190 was donated to the city of New Martinsville for display. 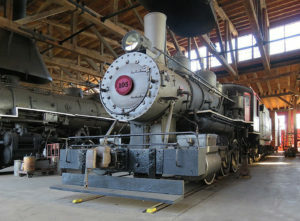 During 1979 the 0-6-0 was moved to the Mad River and NKP Museum in Bellevue, Ohio, where it languished in pieces and its wood cab rotted away. Determining that this B&O steamer had no historical significance to the town of Bellevue (NKP, W&LE, PRR and NYC lines crossed here), the museum in 2008 sold it to Scott Symons in Dunkirk, New York, where he hoped the engine could be repaired and operated. Those dreams never materialized, so #1190 changed ownership once again and during November was moved in four truckloads to its new home at the Age of Steam Roundhouse in Sugarcreek, Ohio. Because this 0-6-0 and its tender have rusted so badly and need just about everything replaced, for now this rare little locomotive will be cosmetically restored, as there are no immediate plans for its restoration for service. On a final note, AoSRH shop employees made several trips to the North Carolina Transportation Museum in the town of Spencer, NC to volunteer our time and expertise in working with the Fire-Up 611 committee to perform repairs to Norfolk & Western J-class steam locomotive #611. 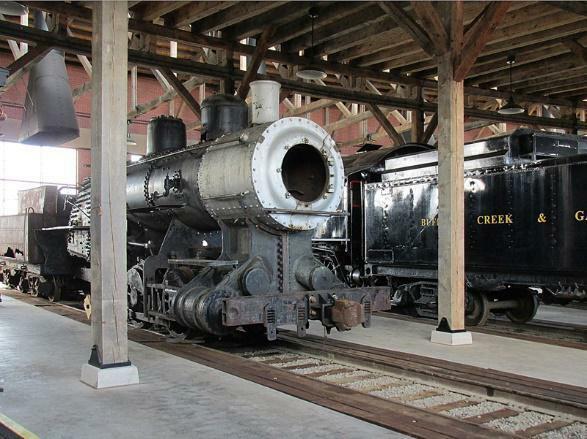 For its rebuilding at the roundhouse in Spencer, the beautifully streamlined 4-8-4 is temporarily away from its usual home at the Virginia Transportation Museum in Roanoke. We Ohioans were warmly received by all those involved with this project, and were able to assist them in many ways for this major rebuilding. 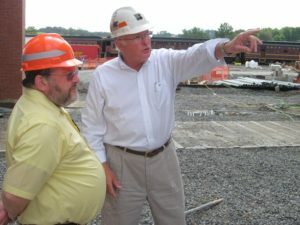 Having the opportunity to work once again with so many notable steam repair experts was a privilege for our entire staff, not to mention the many memories and joyous stories of the past Norfolk Southern steam program that were shared among old friends who had once again gathered to turn a wrench on #611. Whenever you see them, please be sure to thank the members of our country’s Military Service. These patriots perform an immeasurable service by protecting our great country and providing all of us Americans the many freedoms that we enjoy today. Thank you!!! The Age of Steam Roundhouse crew thanks all of you again for your continued interest in our endeavors to create an atmosphere of the long-ago steam era. Jerry Jacobson and his employees always enjoy hearing words of encouragement and compliments from all of you. We are working on additional, interesting goals for 2015, and we look forward to sharing them with you. From our employees at Age of Steam Roundhouse, we wish the best to our many friends during 2015.